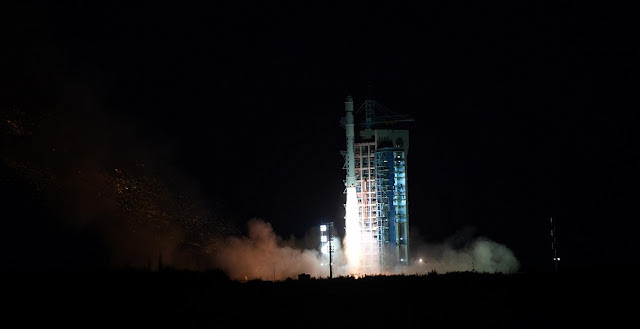 A Long March 2D rocket took to the skies on Tuesday, November 20 (Beijing time) to orbit the Shiyan-6 Earth-observing spacecraft and four smaller satellites for China. Liftoff occurred at 7:40 a.m. local time (23:40 GMT November 19 / 6:40 p.m. EST November 19). The booster rocketed skyward from Launch Area 4 at the Jiuquan Satellite Launch Center (JSLC) in Gansu Province. Confirmation of mission success came from the state-run Xinhua press agency some five hours after launch. “The satellites have successfully entered their preset orbit, according to the center [JSLC],” Xinhua informs. The mission’s goal was to deliver its passengers into a low-Earth orbit (LEO). While Chinese media are not offering any details about the orbital flight, it most likely lasted around 15-30 minutes if Long March 2D nominal flight profile was used. The identity of four other satellites that piggybacked on the mission has not been yet officially confirmed. Xinhua only revealed that they are nanosatellites, not disclosing any details about them. Shiyan-6 is a space environment research satellite, which, according to Xinhua, will be employed for conducting space environment exploration experiments. First satellite in the series, Shiyan-1 was launched in April 2004. Western media outlets, including NASASpaceflight.com, reveal that the quartet of Shiyan-6’s co-passengers most likely consists of: Jiading-1, Tianzhi-1, Tianping-1A and Tianping-1B. Developed by Chinese company Shanghai OK Space, Jiading-1 (also known as OKW-01), is China’s first privately designed LEO communications satellite. The spacecraft weighs around 110 lbs. (50 kilograms) and has dimensions of approximately 27.5 by 16.7 by 19.7 inches (70 by 42.5 by 50 centimeters). The satellite’s main task is to perform tests for the Xiangyun Satellite Constellation project. Very little is known about Tianzhi-1 and Tianping-1 duo. According to NASASpaceflight.com, Tianzhi-1, which was developed by Chinese Academy of Sciences (CAS), has a mass of about 59.5 lbs. (27 kilograms) and is a technology demonstrator, while both Tianping-1 spacecraft, based on the Pina satellite platform, are planned to be used as accuracy calibration of ground monitoring and control equipment. The Long March 2D is a two-stage rocket developed by the Shanghai Academy of Spaceflight Technology. It is mainly used to launch satellites to LEO. The 135 feet (41.15 meters) tall booster can launch payloads of up to 3.5 metric tons to LEO and has an SSO capability of up to 1.3 metric tons. The rocket was launched for the first time on August 9, 1992, from JSLC, orbiting the Fanhui Shei Weixing FSW-2-1 recoverable satellite. Tuesday’s mission was the 292nd orbital flight of the Long March rocket series. It was also China’s 34th launch this year.